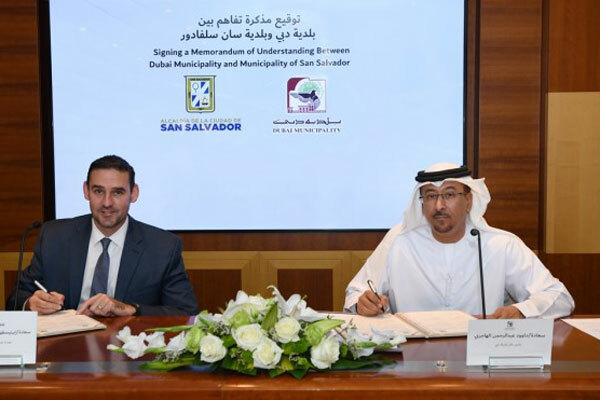 The Dubai Municipality has signed a memorandum of understanding (MoU) with the city of San Salvador, the capital of El Salvador, seeking bilateral cooperation in various fields of common interest. "This strategic partnership reflects our commitment to open new channels of effective dialogue and constructive collaboration with the leading players in infrastructure services and business development, in a move, we trust, will be positively reflected on the municipal sector in Dubai and San Salvador," remarked Dawood Al Hajiri, director-general of Dubai Municipality, after signing the deal with Ernesto Mason García Prieto, mayor of San Salvador. A high-level visiting delegation also discussed ways of enhancing cooperation and bilateral relations and exchanging experiences and best practices in various municipal areas. "We look forward to the transfer of our recent knowledge and successful experiences in the fields of research, development, innovation, environmental services, health and human investment, which is the solid foundation of Dubai's leadership that has proved that Dubai has been an active partner of global communities," remarked Al Hajiri. The signing of the MoU is only a basic building block for future work. This was the result of a joint effort by both sides to exchange information and experiences and the care to deepen the bonds of friendship and cooperation that unite the two parties, he stated. The MoU included the formalisation of cooperation in various civic areas through the promotion of business meetings and encouraging the exchange of experiences in business development, as well as enabling investment opportunities. It also included the development of municipal services through the promotion of bilateral projects aimed at improving the overall promotional projects, based on the integration of innovative practices previously agreed upon, he added. The MoU also provided for the promotion of various administrative, technological, educational, developmental and management practices as well as the field of risk management and renewable energy, and the exchange of field visits to identify the latest developments in global municipal areas.